The Mount Royal Cougars fell to a 3-0 defeat to University of Fraser Valley thanks to a Gurmaan Jhaj hat-trick on Saturday Sept. 15. The Cougars managed to bounce back against UBCO the following afternoon, shutting the Heat out 2-0. UFV were by far the more dominant side on a cold and misty afternoon in Calgary, as Jhaj scored twice in the first half. He added one more to his tally in the second half with a decisive penalty after Trevor Zanatta was brought down by Cougar captain and centre-half Daniel Harrison. The afternoon was not short of drama as the Cougars were lucky not to go down to 10 men after Mateo Ossa allegedly stamped on Anthony Vega, but it didn’t prevent the Cascades from winning comfortably. MRU weren’t without their chances though. Moe El Gandour took on an impressive run into UFV’s box before passing to Orest Ndabaneze, whose close-range shot was turned behind by keeper David Hicks. Moments into the game, the real drama came to fruition. After a foul on MRU’s Hafiz Mahjor, an apparent stamp by Ossa on UFV’s Vega sparked a mass confrontation. None of the match officials saw what sparked the incident but the end call was a yellow card given to each for Ndabaneze and Vega for their part in the melee. “I didn’t see [the alleged stamp], that’s seventy yards from us, I have no idea. The ref and linesman are right there, if it is a stamp I’d hope they’d see it and give a red card,” says Cougar coach Ryan Gyaki. After an electric first half, the second half was much more subdued, but UFV remained the more dominant side. Jhaj’s hat-trick was complete with 20 minutes to go when his teammate Zanatta went down on the edge of the box by defender Harrison. Referee Raul Brisno pointed straight to the spot and Jhaj sent keeper Sterling Kerr the wrong way to put the result beyond doubt. The Cougars had more chances in the closing stages. Jake Vickers fired just wide from the edge of the UFV box, before Patson Choebefu powered through the defence and forced a corner by running down Hicks. But they couldn’t take a clean sheet from the Cascades and prevent a third straight defeat. Coach Gyaki wasn’t best pleased at the result. 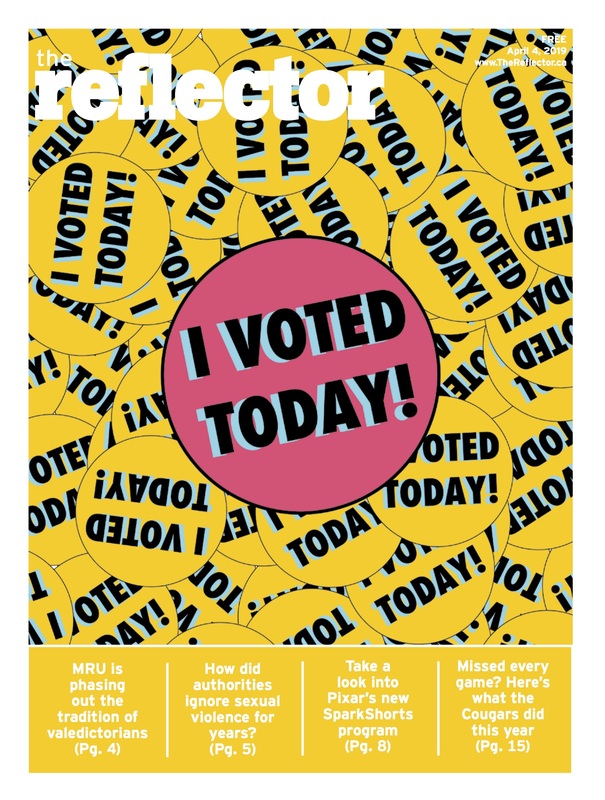 “We came out flat, individuals didn’t play their roles or didn’t do their jobs. People didn’t use their head enough, were too excited, weren’t composed enough. And then when you have a chance to tie it 1-1 and you don’t take it, it’s stupid. There weren’t a lot of bright performers out there. Our centre-backs were incredible, if it wasn’t for them it could have been worse. We need to move more as a team, and think more as a team. We did not move the ball for some reason,” he says post match. Despite this loss, the Cougars recorded a convincing 2-0 victory over UBCO on Sunday afternoon. An early goal by Ndabaneze, his third of the season, matching his total goal scoring number of last year already, was exactly what the team needed after the 3-0 defeat. MRU were intent on avoiding a repeat of Saturday and nearly capitalised on a couple more chances later in the half. Similarly in the second half, the Cougars continued to keep pressure on the Heat. The Cougars put the game to bed 11 minutes from time after they won a free kick on the edge of the Heat’s box. Rohin Nazari’s daisy-cutter powered shot under the feet of everyone and into the bottom corner of the net. Cougars bench boss Gyaki says that his side’s performance was the response to Saturday’s defeat he was looking for. “This year we wanted to try and have a more stable line-up, but even in practice for the last week the guys we were relying on and trusting each other, just weren’t there a 100 per cent. They weren’t playing bad, but they weren’t there,” he says. MRU are sitting third place in the Prairie Division heading into the final weekend of the month. 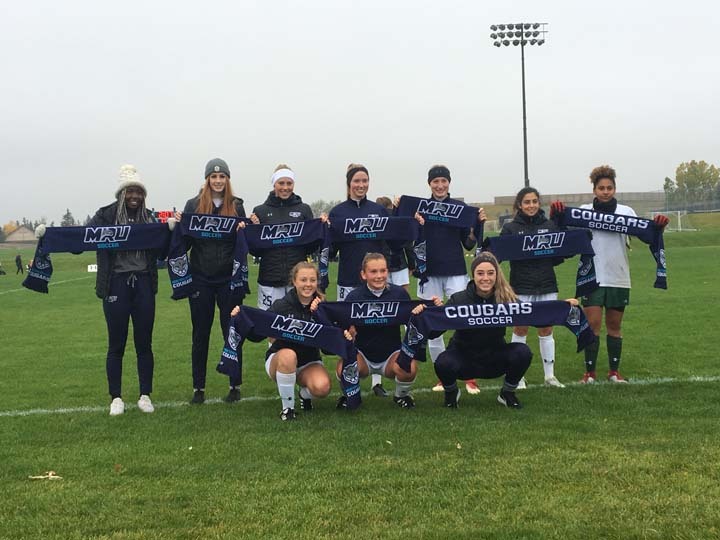 The Mount Royal Cougar ladies suffered their third loss in five games after a 2-1 home defeat to UBCO in their home-opening match. First half goals from the Heat were enough to ensure three points left the Cougars. A second half goal for the Cougars, scored by Jullien Ramirez proved to be little more than consolation. Both sides appeared to struggle on a greasy pitch in near-freezing temperatures, with both squads giving the ball away cheaply while both goalkeepers found themselves scrambling to keep control of flying balls. Throughout this scrappy game, however, UBCO were the more dominant side. The Cougars improved considerably in the second half, applying plenty of pressure on the UBCO goal. On the hour mark, they halved the deficit after bombarding the goal. A floating cross found Hannah Park whose inital shot was saved. Rookie Natalie De Marco’s shot ensued but was robbed by the UBCO keeper who recovered on the ground to stop a second shot. Finally, the ball fell to the feet of Ramirez, who bundled the ball into the net. However, the Mount Royal University ladies secured an emphatic 4-1 victory over Thompsons River University on Sunday morning. “We are happy with the three points,” Fusco commented smiling ear-to-ear. Two goals from rookie Robyn MacDonald and a goal each by Haley Nicholson and Erin Holt, all in the second half, ensured that the Cougars could put Saturday’s defeat to TRU firmly behind them. The first half was a turgid, dreary affair, with both sides having chances to score that weren’t taken powerfully enough. Neither side’s goalkeeper was tested as the teams tentatively sized each other up. At the end of the first half the cougars found themselves frustrated when Nicholson slotted the ball into the TRU net after receiving a late pass from Holt on the wing. Despite claims that she was behind the ball when it was crossed, assistant referee Hanna Johnson ruled that she was offside, and the goal was controversially chalked off. With 20 minutes to go however, MRU finally broke the deadlock. Nicholson found herself standing over a free kick on the edge of the penalty arc and let it fly straight towards to top corner of the net. This opened the floodgates. Three minutes later, a corner was sent into the Wolfpack’s box and after causing chaos, it took a decisive touch off MacDonald’s leg and found itself in the back of the net. Then, another set-piece came with another goal. Holt took a short corner, playing a one-two with De Marco. She set her feet and blasted the ball from the wing straight into the roof of the net. They weren’t finished there either! MacDonald took a shot straight at the goalkeeper, but her clearance only got as far as Nicholson, who passed it back to MacDonald. MacDonald gratefully bagged her brace. It wasn’t all plain sailing for the Cougars. The referee judged a shot by TRU’s Mendonca to have been handled by Claire Thorimbert in the area and pointed straight to the spot. Mendonca made no mistake in sticking the ball firmly into the corner of Rose Hemans’ net. Not that it wiped the smile off the faces of the Calgarians, who bagged just their second win of the campaign. “We wanted the ball more, we got away in the first game but stuck with it this game.” Fusco said. “Once we got the first goal we wanted to keep pushing the tempo and did just that,” rookie MacDonald commented after her two goal performance Sunday afternoon. MRU improves to 0.500, picking up their second win of the season.